When I ask the participants in my seminars what the most important thing in their lives is, I get answers like: Happiness, success, love, health, recognition, contentment, trust, and so on. When we take a closer look, we see emotional states behind these values we aspire to. Most people do a lot of things to have good feelings. If that is so important, we really ought to have learnt at school how we can actively influence our feelings. Usually, we haven't. 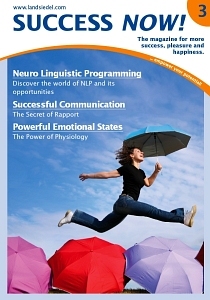 NLP teaches plenty of ways of positively influencing our emotional state and that of our fellow human beings. Our behaviour depends on our state, which is affected both by our inner imagination and our physiology, i.e. you can change your state by imagining something else or by changing your physiology. If you shuffle around slowly in a depressed way, you'll eventually feel depressed. To feel enthusiastic and dynamic, move that way. Stand straight up, take a deep breath and tense your muscles to get yourself into an energetic state. Doing sport has the same function and the effect are long-lasting. Sometimes a change in breathing is sufficient to feel differently, e.g. when relaxing. Charlie Brown explains to his girlfriend Lucy: "If you want to feel depressed, let you head and shoulders hang. Stare at the ground and think gloomy thoughts. If you do that three times a day, you will have a good chance of becoming depressed." Give it a try straight away. Of course, you can also apply this principle the other way round Stand up straight with your feet a shoulder's width apart. Lift your arms, breathe deeply and say: "Today is a very special day! I love my life." In what we call the stuck state, we are stuck and blocked. We do not have access to our resources. Possible stuck states may be: Despondence, fear, shock, stress before an examination or a speech. We sometimes call this a physiology problem. To get out of a stuck state, a separator is important. This interrupts the current state and we regain at least a neutral state, which then provides the basis for building up a resource state. A very natural separator can be to distract oneself, to do something else or go for a walk. During training or coaching we often request our client to think about something else by asking a "crazy" question to provide a distraction. In addition or alternatively we could invite the client to change their posture. In the resource state, we are in full possession of our resources and positive energies. We feel richly blessed with everything we need for life. This is the best state in which to set goals, make decisions or discuss important issues. The more time we spend in this state, the better for our lives. In this state we feel strong and happy. We have freedom of choice and can shape the future. In consultations and coaching sessions, we meet other people who are in a stuck state. This forms the basis for a desire to change. The stuck state is interrupted and then, by adding resources, a positive state is created. Which states would you like to have more often in your life? Which states would you like to have less of? What would that mean for the quality of your life? What can you do to spend more time of your life in the desired state?